It was 2 degrees F this morning when we got up. Yes, 2. Without taking the windchill into account. That isn't the worst part - the sun makes it look like it is much warmer, a sort of weather joke. Snow is forecast for this afternoon and evening, however, so maybe it will look as cold as it actually is. 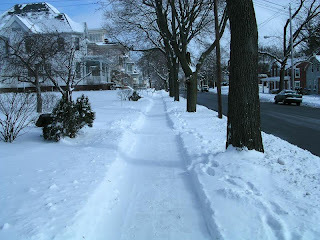 Here are a couple of pictures taken yesterday on my walk to the library, when it was a (relatively) balmy 14. Oh, and happy Leap Day. I have a problem with grocery store induced amnesia. I always, always manage to forget something - the all-important list is the worst, since I can't do anything without it. If I make the list on my own, I tend to forget some vital ingredient for a meal, say, the fish for a fish dish, or I don't remember to check how much of a crucial ingredient we have. Usually not enough is the correct answer. Today, I ran to the store to get a few things, and I managed not to get the first two things in my basket. Now, how can this happen, you ask? I have no idea. I know that I put them in my basket, and I thought I put them on the conveyor belt at the checkout counter, but when I was unloading the bag at home, they were nowhere to be found. At least they were also missing from the receipt - so I didn't get charged for something I didn't actually get home. Sigh. A day and night of snow = approximately 7 (maybe as much as 9) inches accumulation + driveway = 45 minutes of shoveling = 296 calories burned. Not actually sure about the accumulation, since it comes from my very unscientific estimate with a ruler - but it was fairly consistent at 7 inches in the back and front yards. 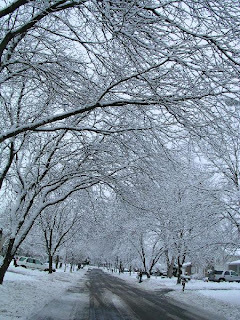 More snow possible throughout the remainder of the week. I spent most of yesterday in a state of semi-hibernation. I think winter is even starting to get to my two Texas kitties - Cleo hates the cold and constantly burrows under the covers, and Oliver misses bird watching and cockroach chasing, not to mention eating grass. It was 92 in Austin a couple of days ago - can't say that doesn't sound at least a little bit appealing at the moment (of course, I would be complaining about it if I was actually still there). We now return you to your previously scheduled season. Yes folks, after a brief teaser of spring over the weekend, winter has returned. It is snowing, with the possibility of 10 inches by Wednesday evening. I hope so - I am going to feel cheated if I spend a winter up here and never get a really big snowfall! Despite the snow and bitter cold that are predicted for the rest of the week, there are signs that spring is really coming. We have had lovely, sunny weather for the last few days - the snow and ice on the sidewalks is decreasing, roofs are clear - and this morning, I saw three more signs. (1) The first woodchuck of the new year! I was on my way out to fill the bird feeders in the backyard when I heard a crashing and rustling in the dried grass and weeds along the fence, too loud to be a squirrel and they run up the power pole anyway. When it emerged near the corner of the yard, heading for the mini-wilderness of the canal berm, it was revealed as a woodchuck. Hooray! (2) Also while I was out filling the bird feeders, I heard rapid tapping, and discovered a woodpecker drilling away at the top of a tree in the neighbor's yard. (3) I saw a couple of birds (starlings?) either starting a nest, or feeding babies in the hole in the side of the neighbor's house. This is an interesting hole - during the late fall and early winter, it was occupied by a pair of squirrels. Don't know if it is a purpose built squirrel hidey hole, or an accidental one, but they certainly made it there own. Haven't seen them in a while, and now it appears to be a bird hole. Surely true spring can't be too far behind! Here in NY we have a bottle deposit on certain bottles (caffeinated beverages and beer basically) that means you get charged 5 cents per bottle when you buy the product, which can be redeemed when you take it back. You can also make some money by collecting bottles on the sides of the road (or canal in my case). Some groups, like the cub scouts and the local college rugby team, use this as a fund raiser. I think this is great - I took in a bunch of bottles yesterday and made $4.55. Yes, some of those cents were ones I already spent, but a good proportion was stuff we collected. And yes, that isn't much money, but it certainly feels like money out of nothing - I hardly had to do any work to get it - just pick up bottles that I would probably pick up anyway. The shame is that bottles of water, sports drinks, and tea are not redeemable. Apparently they were fairly rare when the law was enacted here, but are now sold in epidemic proportions. I think there is a bill going through the State House to get them included. I hope it works. Also, I have read some commentary that the deposit should be raised to 25 cents a bottle to help encourage recycling. I'd be for that - if it included water, it might also help cut down on the amount that people buy. I mean, tap water is basically free, and is usually better tested than bottled water. And it doesn't produce lots of trash. Get out the rye bread and the mustard, Grandma, it's grand salami time! 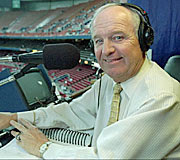 Dave Niehaus, the voice of the Mariners, is finally headed to the Baseball Hall of Fame. It is about time! One of the reasons I have remained faithful to the Ms all these years of bad baseball, under-performance, long distance listening, is Dave. He is the Mariners. He doesn't chatter too much about things that aren't relative to the game at hand. He doesn't shout too much, or too little. He is as much of a fan of baseball as anyone can be. And he richly deserves to be in the Hall of Fame. Here is the short article announcing the award. Yay Dave! Update: Here is a link to the Steve Kelley article about Niehaus that says what I was trying to say, only better. Yup, it's Tuesday again. In these past few months, I have decided that Tuesday is (1) my least favorite day of the week and (2) really boring. I mean, Monday is the first day of the week, if you count Sunday at the end of the previous week. Even for me, who stays at home all the time, Monday has the feel of a new week. Wednesday is the middle of the week, halfway until the next weekend. Thursday is almost the weekend, just one more day. And Friday is, well, Friday. But Tuesday - all the interesting things that happened over the weekend are forgotten and put away, and the next weekend is too far away to really be discussed yet. Very little seems to happen on a Tuesday. It is garbage night - time to put out the bin for tomorrow's pick-up. That's about it. Since it is Tuesday, and therefore nothing is happening, here is a picture from a week or so ago, after an ice storm followed by a snow storm. Here is a laugh for your Monday - a set of blocks from China designed to help teach children English. It starts well enough, but check out the later ones! Oh dear. Found courtesy of Cogitamus. ...we're in the canal! 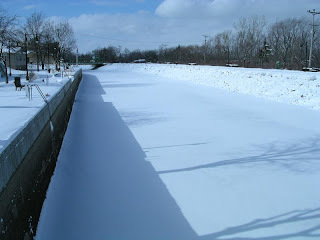 On our Saturday walk we noticed that someone had driven a snowmobile down the middle of the canal (that's the track to the left of Benjamin) and decided that this was as good a time as any to take a stroll in the canal. I doubt I would have tried it without the previous evidence that the ice was strong enough - I didn't grow up somewhere with ice that you could walk on, so I am a little bit nervous on that front, although I do know that people go fishing on it, play hockey on it, etc - but I figured I weigh less than a snowmobile. It was really cold last week, and the ice was pretty thick. 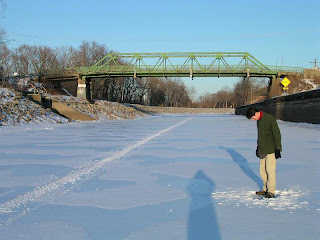 Besides, the canal is really shallow right now, and if the ice broke, the worst that could happen would be for us to land up to our knees in cold water. Well, we didn't fall in. I wouldn't try it today though, because there's been a bit of a thaw over the weekend. Our local newspaper did something the other day that baffles me - it ran an article in it's Life section about great meatless meals for Lent, but didn't include a single recipe. It had pictures of the vegetarian chili and spanakopita, but at least for the latter, it said that it was really difficult to make but not hard to order at a restaurant! What?! I don't want to go to a restaurant to eat something you recommend, I want to know how to make it myself. (I did find several easy-looking recipes on the web, and plan to try one of them soon. The only difficult thing is the phyllo dough, but even then, it isn't like you actually have to make it!) In the same section, there was also an article on how to lighten up casseroles, with a picture of a tater tot and chicken casserole, without the recipe, again (not that I wanted to make it, but the principle applies). To try to be fair to the paper, the article was something off the wire, not written by their staff, but still. That sort of patronizing writing (it's too hard, go to a restaurant) really irritates me, and just goes to illustrate that Rochester is most definitely not a foodie town. Just back from a walk to the library. Walking is definitely my favorite form of locomotion. Sure, it takes longer than driving or riding my bike, but I get to see things and have enough time to register them in my mind. I can hear the birds singing, watch squirrels chase each other, smell the grass growing (well, not right now). This time of year, I get to feel the crunch of snow and ice beneath my feet, and notice the regression of the ice where the sun has been shining. Every time I walk along a familiar route, I see things in a new way - maybe I notice the color of a house, or the unique shape of a window, or a certain tree. That is harder to do by bike, and almost impossible by car. I have time to think, time to let my mind free itself of all the niggling worries and fears that swirl around my brain on a regular basis. When I was searching for cures for the hives that occasionally plague me, I once found a doctor online who said that if you could walk at a steady pace for 8-10 hours you could get rid of all the chemicals in your body that trigger the attacks. I can believe it - walking can certainly be a form of therapy. And I never have to worry about finding a parking space, or a bike rack. This is a call for help from my knitting knowledgeable friends: I need to learn more about knitting, but there are a lot of books out there. Which ones do you recommend? Which ones should I buy, and which should I only check out from the library? I want to be able to knit more than scarves, but probably have a long way to go before socks or sweaters. Leave me a comment, or recommend something through GoodReads. Well, not here it isn't, not really. The beautiful, small, pink buds I saw on a tree yesterday are a sign that the end is in sight (even if it is 2 or 3 months away), but it started snowing again yesterday afternoon, and is still at it. However, Mariners pitchers and catchers report to spring training today, and the rest of the team can't be far behind! Three cheers for baseball - even with the acrimony surrounding the semi-controversial Bedard-Jones trade, and with the Rocket on the Hill denying he (or his wife - who cares if she used it, is she in line for the hall of fame?) ever used rocket fuel, baseball is starting again. Spring and summer are just around the corner. Soon these days of cold and snow will be just a memory, and we will be eating fresh produce and listening to J.J. Putz strike out the side in the bottom of the 9th to win the game. Hooray! And tomorrow is Valentine's Day. I am celebrating by baking an Orange Cardamom bundt cake - any excuse for yummy baking works for me! ...In our ongoing fight against plastic. We managed to get through our weekly trip to the grocery store without getting a single new plastic bag. For produce, we either didn't put the item in a bag - seriously, why does one lemon or one tomato need to be in a bag anyway? - or used a recycled bag we brought from home. Of course we used our canvas bags for the trip home. By swift action, we managed to avoid both the extra, unnecessary bag around the already well wrapped fish and the one that the pharmacy puts around the bottled prescription. Yay us. Unfortunately, we did end up with yet another small plastic tub (which is unrecyclable in this neck of the woods - we have to send them home to my parents for that) when we bought feta. Too bad we can't bring our own container to the cheese counter and ask them to use it instead. A nice homey, hippy co-op would probably do it, but not Wegman's, I'd wager. We already get our eggs from the (semi) local co-op/natural food stores, because I can't stand to buy the ones in styrofoam that probably come from chicken concentration camps; now, we might start buying our milk there too. Last week when I dropped in to get eggs, I noticed that the store had milk from one of the other Rochester suburbs. Since we already had enough milk for the week I didn't buy any, but next time I probably will. Since it is another snowy day here in Brockport, and is the middle of February (meaning nothing much is going on), I thought I would give you a small laugh today. Here is a picture we saw in the entrance to a local bar. I sent it in to the "blog" of "unnecessary" quotations marks, but it never got put up. 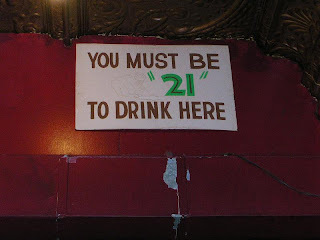 So, how old do you think you actually have to be to drink here? Keep in mind this is a college town. Is it some way of telling students that your ID has to say you are 21, but that they won't actually check? Or do you really have to be 40? We are having another day of icy/slush/snow mix. Yuck. I spent an hour chipping, scraping and shoveling out the driveway. It was like shoveling the remains of a snow cone that has had all the flavor sucked out, then was stuck in the freezer for a couple of hours. What I really wanted to do was take the hair dryer out and use it to melt all the slush, but that probably would have burnt out the motor. Anyway, to get to the title of this post - there is a driving school down the street from us, and we often see pupils and their poor driver practicing parallel parking up and down in front of our house. Today, one of the ickiest of the last couple of weeks (apart from last Wednesday and Friday), appears to be test day. Instead of the usual car marked with the logo of the driving school, there are lots of cars going by with a teenager and an adult, executing turns. Glad it isn't me. I am sure that you experienced knitters out there could have told me this, but knitting while drinking margaritas is probably not a good idea. I was hoping to whip out one last baby wash cloth last night while watching the Super Bowl, but a combination of a margarita (I only had one! but it was on a mostly empty stomach) and TV distraction (favorite ad: Duane Wade and Charles Barkley fav 5) meant that I only got about 14 rows done, and then I noticed that I had an extra stitch, which threw off the whole pattern. I carefully unraveled 2 rows without finding the culprit, and then decided that, since it was the 4th quarter and I was tired, I would just scrap the whole thing. I will have to start over today. Sigh. On the up side, the Giants won - almost our home team (sorry Buffalo), well, state team at the moment. And, I got my invitation to Ravelry - an invitation only knitting web site that Bonny Anne introduced me too. It looks like it could take up a lot of my time, if I let it. You can look for patterns, ask questions of other knitters, keep track of your projects and all sorts of interesting things. Since my projects are basically nil at the moment, as is my stash, I don't have much to record yet. If you are on, search me out. Friday! It is sleeting outside at the moment, after a couple of layers of rain and snow, which means it is slippery and nasty out. I just sent Benjamin off to work, feeling rather like a 1950s TV wife/doting mother as I made him take a hat and umbrella and got his (hand-knitted) scarf for him. Personally, I don't plan to go outside unless I have to. I will probably need a walk at some point, and may have to go pick up cat food at the pet store, but otherwise, I intend to stay in and bake sourdough bread. Homemade pizza for dinner tonight. Yum. At least when it snows here, school gets canceled - we heard on the Toronto radio station that the school buses are canceled, but not school. The poor kids have to walk to school in the snow and nasty weather! Urgh. Superbowl on Sunday. We don't have any plans, other than to watch it, and maybe make some guacamole. Yum, guacamole. I will probably be pulling for the Giants. I don't like cheering for the favorite unless it is my particular favorite.